Nowadays, modern treated pine fencing is extremely resistant to termites, fungi and bores meaning that they require very little maintenance. The treatment also prevents the fencing from decaying from exposure to extreme hot and cold weather conditions over time. However, as with any other home installation, it is important that you do what you can to keep your fencing healthy and to ensure that it performs to its full potential. Timber fences will last for decades, but they do need some maintenance from time to time so that they continue to look good and remain strong. Keep reading to learn a few things you can do to keep your wooden fence maintained all year long, no matter what the weather or where you live in Australia. Normally timber fences can withstand whatever the weather can throw at it and so your general maintenance will simply involve removing dirt and other debris when necessary. Pressure washing or using a high-pressure setting on a hose is a quick and efficient way to do this. If you run into any particularly problematic areas, you might need to do a little scrubbing by hand to get rid of anything that has really stuck on hard. If possible, choose a warm, sunny day to do your cleaning as the water will dry quicker. Treated pine timber fencing is the best choice if you are looking for a durable and long-lasting fencing option as the treatment protects against damage from insects, rot, fungi, the weather and water. A treated fence means less maintenance and higher durability, therefore choosing treated pine for your property’s fencing is a great long-term investment. In the rare situation that your fence becomes damaged, be sure to repair it quickly to prevent the damage from getting worse. 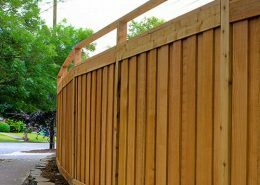 Timber fences can be repaired easily, or if you want to be sure that the repair is done properly, just get in touch with your local professional fence builder or fencing contractor to get the job done right. Be sure to trim back bushes, branches and other plants away from your timber fence. They can hold on to moisture, which can cause problems for the fencing over an extended period of time. Also, you will no doubt want your beautiful timber fencing to be a feature of your home without have anything obstructing people’s view of it. In Australia, there is a big problem with termites because they can literally eat you out of house and home. It’s always a better option to prevent their arrival rather than having to exterminate them. Termites like moist soil, so try and keep your fence above ground as much as possible to stop them from finding their way into it easily. However, with a treated pine fence, the treatment will already act as a great line of defence against those pesky termites, minimising the risk of damage. Maintaining timber fencing doesn’t need to take up a lot of your time, in fact, with a treated pine fence you’ll have very little maintenance to worry about. To ensure that your fence stays durable and stands strong for many years to come, be sure to hose it down when necessary, keep it clean and keep plants and bushes trimmed back. If you notice any damage, be sure to take action quickly and always call your fencing contractor if you need assistance with repairs. With a little care and maintenance, you can be sure that your timber fencing will look great and keep your home protected for decades. 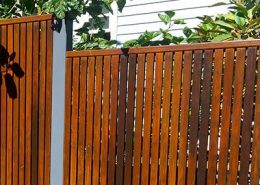 Get your free steel fencing quote with Australia’s number one timber fencing installer.